Rutgers, The State University of New Jersey, is a leading international research institution. • Students with high school marching band experience may sign up for the Marching Scarlet Knights. Chartered in 1766, Rutgers is the eighth-oldest institution for higher learning in North America, with universities in New Brunswick, Newark, and Camden and a Health Sciences division with locations across the stateof New Jersey. Rutgers University–New Brunswick is the state’s most comprehensive intellectual resource and the flagship campus of Rutgers, The State University of New Jersey, as designated by the Association of American Universities (AAU). Rutgers University–New Brunswick is the largest and most residential university within the Rutgers system. It offers more than 100 undergraduate programs of study and includes five campuses with a variety of settings. Students enjoy state-of-the-art classrooms and laboratories, six vibrant student centers, four dining halls, and ultra-modern recreation facilities—all in addition to a college town with boutiques, shops, four-star restaurants, comedy and music clubs, and three theaters. 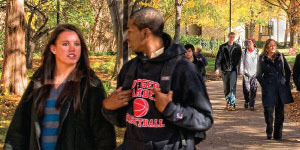 Students choose Rutgers University–New Brunswick because its five campuses have the friendly feel of smallerschools and the boundless resourcesof a leading research university. Itcomprises 17 schools and colleges, 12 of which enroll undergraduate students and together offer more than 4,000 courses. Here you can double-major in four years or earn a combined BA or BS and master’s degree in five years. For example, are you interested in getting a bachelor’s degree in History and a master’s in Public Policy? Economics and a master’s in Public Health? How about Engineering and an MBA? Want to pursue teacher certification with an MEd? You can do that here! You might also pursue aseven-year BA/MD program or a six-year PharmD program—and there’s so much more. As a first-year student, you can quickly connect with senior faculty and other students in topic-driven first-year seminars capped at nomore than 20 students. In addition, you can choose from more than 180 study abroad programs in 60+ countries...spend a semester, summer, or whole year becoming a global citizen. Rutgers is a public research university with groundbreaking projects inareas as diverse as stem cell research, education equity, and oceanography. In fact, Rutgers University–NewBrunswick and Princeton are the only New Jersey schools in the prestigious AAU, whose 62 members are NorthAmerica’s leading research universities. The majority of Rutgers undergraduate students conduct original research in the more than 175 research centers and institutes on our campuses. You’ll have the opportunity to work closely with distinguished faculty in developing solutions to society’s greatest challenges. The city of New Brunswick is a culturalhot spot—people come from all over to experience the city’s museums, plays, operas, choirs, symphonies,quartets, live jazz, dance performances, art installations, “basement music,”comedy club, and film festivals. Rutgers University–New Brunswick’s prime location between New York City and Philadelphia provides you with accessto thousands of employers and internships and the world’s best art and entertainment. In an hour or less bytrain or car, you can find yourself applauding a Broadway performance, exploring the Museum Mile, viewingthe Liberty Bell in Philadelphia, hiking or skiing mountain trails, or soaking up the sun at the famous Jersey Shore. And if you’re looking for careeropportunities, you’ve come to the right place—21 of the world’s Fortune 500 companies have their headquarters in New Jersey. Career counseling, learning resource centers, health services, academic advising, undergraduate research, and leadership training are just a small sampling of services available to students. In fact, Rutgers hosts dozens of job and internship fairs and is a preferred recruitment site for more than 650 corporate, nonprofit, and government employers who visit Rutgerseach year. Rutgers’s Career Services, one of the largest and most comprehensive in the United States, sponsors internship fairs every year to enable Rutgers sophomores and juniors to begin honing a competitive edge in the global marketplace. With more than 500 student groupsto choose from, including RutgersFormula Racing, a seeing-eye-puppy-raising club, many honor societies, and more than 80 fraternities and sororities, Rutgers students can get involved in activities that range from community service to almost every variety of social, cultural, and athletic club. Rutgers students also donate thousands of hours each year to service projects such as Dance Marathon, Recyclemania, and Scarlet Day of Service. As a member of the NCAA Division I Big Ten Conference with 24 competitive men’s and women’s sports teams, the Scarlet Knights provide thrills and excitement, drawing crowds from the Rutgers University–New Brunswick community and the greater New Jersey/New York/Philadelphia region. Students who wish to prioritize their academics and still compete in intercollegiate athletics can choose from nearly 50 student-run sport clubs, including a nationally ranked cricket club and a highly competitive icehockey team. Extensive recreational facilities on all residential campuses make it easy for students to stay fit and have fun. 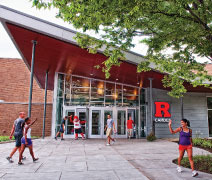 Rutgers’s Division of Housing and Residence Life serves the largest on-campus student population in the country: currently more than 16,000 residents. Housing options includesmall houses, apartments, suites, and large residence halls in a variety of settings, including a plaza with a first-run movie theater and a classicNew Jersey diner! Students can even choose special-interest living-learningcommunities such as Honors, Engineering, Television Production, Creative Writing, Language Houses, and a women-centered community focused on global leadership.